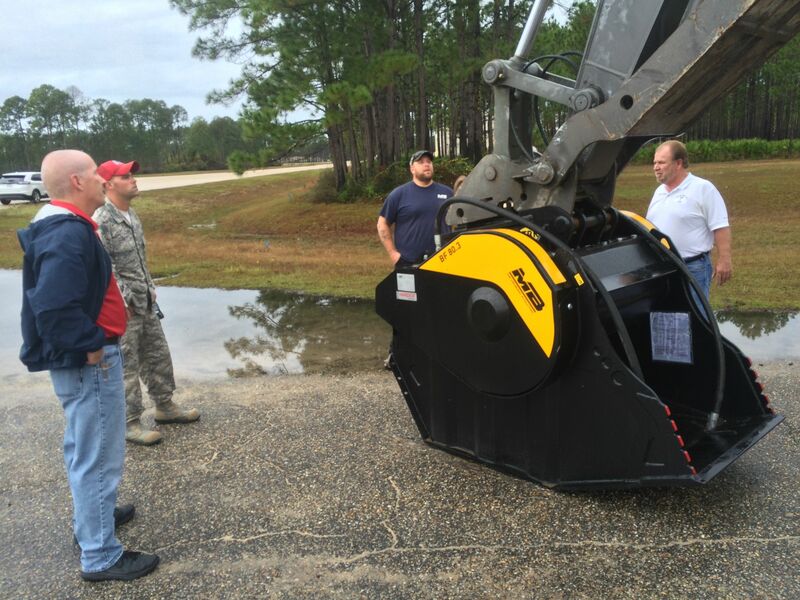 Tyndall Air Force Base Gets First BF80.3 Crusher Bucket - MB S.p.A. The BF80.3 crusher bucket was a new addition to the crushing line in 2015. By mid-2015, MB America received its first BF80.3 at its facility, which was sold to Tyndall Air Force Base shortly after its arrival. The US Air Force Civilian Engineer Center at Tyndall Air Force Base in Florida purchased the crusher bucket to use for research and development testing for its Airfield Damage Repair (ADR) mission modernization program. The testing includes crushing on-site materials to refill and repair runway craters. The MB product line continues to expand since the corporation began in 2001. The BF80.3 was added as a crusher bucket to accommodate medium-sized jobs for excavators weighing over 40,700 pounds. It has an adjustable output from 5-inch to 3/4-inch with a productivity range of 45 cubic yards per hour (roughly 67 tons per hour) to 13 cubic yards per hour (roughly 19 tons per hour), respectively. Tyndall Air Force Base will have its testing on July 6 and 7, 2016. Federal officials are invited to attend. Please RSVP by contacting MB America at 855-MB-CRUSH (855-622-7874).